Our CArnival games, are Game Changers, Literally. 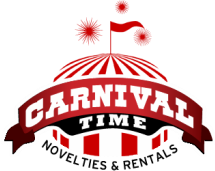 You'll love these carnival games at your party. They are easy to maintain, setup and take down and add so much more to your party. Kids of all ages love this oversized version of the classic ring game! Guaranteed to be a hit with family and friends at birthday parties, family reunions, community centers, after-school programs and more. Young players build teamwork and cooperation skills while they learn to match four to win. This interactive game is great for two players and also works well with teams for epic kids-vs-grown-ups championship matches. 48" x 22" x 46"
Great Family or for group parties! - The Stack & Tumble is the ultimate family game creating a chance to spend quality family time together! Also these big blocks are great as a party game for youth groups, tailgating, camping, BBQ, wedding and special events. This is a classic outdoor lawn game! 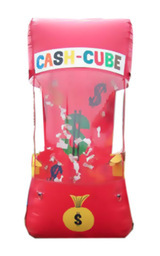 The cash cube is a fast way to add excitement to any event. Often used at auctions as well as kids parties. The cash cube is easy to run with single button switch, makes it easy to operate too. Fun and exciting game game for all ages. Throw beanbags to knock out Bob’s teeth. Skeeball is one of those games that bring back the nostalgia of so many of our childhood memories. You cant't help but roll one more time. Mini Basketball games have been around for decades and this classic carnival game helps bring back that "Swoosh" feeling for all those (basket) ballers out there. The Purle Cup Toss is very a fun and challenging carnival games. Get a whiffle ball in the purple cup and win big. Fun for all ages. Ahh the classic ring toss makes all that love of ring throwing come alive in this classic game. Putter up. Get your swing on and take your chances at a hole in one in this classic carnival game Fun for all ages..
​This Giant UNO Card Game is the perfect way to infuse some giant fun into your next party or event! Giant Checkers is a fun,challenging game for all ages to enjoy. An ideal way to learn stratedy and planning and to involve youngsters in more tactical games. Great for outdoor events and parties. There is nothing more impressive than our giant chess set. Imagine those warm summer evenings, with the sun glowing until the late evening, enjoying a glass of your preferred drink, playing chess with your friends. And on this giant scale, it's a game of Chess quite unlike any other. Ready, Set, Hike! It’s your turn to be Russell Wilson and take aims the open target. Tackling not recommended. The clown toss is definitely a carnival classic. Feed this hungry clown with bean bags or sponge ball and be the winner. He's here and he's hungry. Fun for all ages. America's favorite game, You’lll be clamoring to toss one down the pipe to this awesome catcher. Like it's horse racing cousin you get points for tossing balls and making them in the holes. Fun and lasting entertainment. Your little ones will be ringing with excitement when this bell stats going off.. We'll do the setup, you'll have the fun! Pump-pump-pump IT UP! This game might not seem like much but the kids LOVE IT! The short amount of effort to get the balloon pumped up and exploded is worth the anticipation of hearing it POP!